phablet.. Does this name ring a bell? If not, you are about to learn something new… phablets are a new hybrid gadget category, it is a device that takes a middle place between a phone and a tablet. It has a big screen and also works as a cell phone. Here is one typical representative of the phablet category, this is Samsung Galaxy Grand. Not only does this device is a phone and a tablet all in one but it also has a dual SIM capability. The design holds the typical for Samsung curved lines highlighted by a silver metal bezel. The plastic case has a glossy surface and accommodates the 5 inch TFT LCD screen. 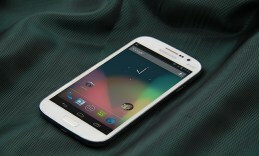 It delivers 800×480 resolution and a pixel density of 187ppi.Galaxy Grand Duos runs Android 4.1.2 Jelly Bean platform. The CortexA9 dual-core processor runs at 1.2GHz frequency and is backed by 1GB of system memory. The on-board storage of 8GB user memory is insufficient, having in mind that with its 5 inch display it is first of all an entertainment device. However, the good news is that the microSD card slot allows you to expand the memory capacity further up to 64GB. On the backside we found an 8 MP camera with an LED flash. The images come out just great in 3264×2448 resolution. The secondary front camera has 2MP and performs great making it easy for you to video share. For its 5-inch dimensions the phablet is extremely light weighing only 162g. At the same time it is great for business people as it combines both work and private SIM cards. The 2100mAh Li-Ion battery on board holds for a day if you play a lot and use the maximum brightness level. To sum up: this Samsung hybrid is a budget friendly solution both for work and entertainment as well.